Congratulations! You made it this far! College applications are finally behind you, you’ve been accepted into college and you’ve paid your enrollment fee. What’s next? Well, as much as you thought all the tough decisions were behind you, there are a few more hurdles to overcome before move-in day arrives. Be prepared though… once you’re completely convinced you found the absolute best roommate, inevitably, reality sets in. Your brain starts wandering, you begin imagining what life in college will be like and you ponder the idea of living in… well, a cracker box, with a person who, quite possibly, you barely know. Let’s face it, the idea of living with anyone in a 12×12 (or smaller) space for an entire year is enough to make any college-bound student feel anxious, apprehensive and frankly, pretty darn frazzled. But, don’t sweat it! Despite a few horror stories you may have heard about college roommates, most people enter into the experience with high hopes, they develop a great, (or, at the very least, an amicable), relationship with their roommate and they survive the experience relatively unscathed. In fact, a lot of college kids look back and consider their freshman year in a dorm one of the highlights of their college experience. From college kids who’ve been in your shoes and who completely understand just how awkward and nerve-racking it can be living with someone, here are the 25 “golden rules” every roommate should abide by to sail through their freshman year in a dorm. This includes everything from a lone pop tart and a bag of chips to a chocolate chip cookie or a package of Ramen Noodles. Food is literally revered in college, so unless you want to see your roommate’s eyes pop out of their head, never eat their food without asking. Even if you and your roommate consider yourself “besties,” when it comes to life in a dorm, there’s still an imaginary line between “your side of the room,” and “your roommate’s side of the room.” Just because you ran out of space on your side of the room doesn’t give you the green light to grab a few hangers from your roommate’s closet and hang your wet clothes on their futon. Most girls who room together love the idea of expanding their wardrobe two-fold by sharing clothes with their roommate. However, just because you asked your roommate 50 times if you could borrow her clothes and she said yes 50 times doesn’t mean you should stop asking. Never assume. Always ask your roommate before wearing her Nike’s, favorite college sweatshirt, comfy socks or anything else for that matter. Girls are funny that way. One of the more difficult aspects of dorm life is the total lack of privacy. Add on a snooping roommate and life can get downright miserable. Take it from those who successfully survived life in a dorm, it’s never okay to sneak a peek at your roommate’s phone, texts, computer or personal belongings. Give them the respect and much-needed privacy they deserve. Every college student has their own study preferences. You might be an early riser who prefers to grab a coffee and hit the books by 7 am, while your roommate might be the type who likes to cram and pull an all-nighter. Cut each other a little slack by being flexible, supportive and respectful of each other’s study habits. College students are notorious for grabbing a little shut-eye whenever they can, day or night, which means you might walk in from a 3 pm class and find your roommate taking a power snooze. Regardless of what time it is, always be respectful and avoid walking in like a bull in a china shop unless you want the wrath of your roomie. Ask any college student and they’ll tell you there’s nothing more annoying than having a bright light shine on your face when you’re trying to sleep. Don’t be that roommate who flips the light switch when your roommate is sound asleep with little regard for their feelings. Avoid getting off on the wrong foot with your roommate by investing in a low-light lamp that allows your roommate to continue his or her slumber without feeling as if there’s a searchlight in the room. The dorm bathroom, a multi-functional gathering place for students. Whether it’s a communal bathroom shared by everyone on your floor or a bathroom shared by a few suitemates, dorm bathrooms in general, have been known to become veritable biohazards. While it may not be reasonable to think you can keep it spick and span all the time, it is important that you do your fair share to keep it clean by not leaving anything behind you yourself wouldn’t want to clean. In college, getting kicked out of your dorm so your roommate can have “private time” with someone else is all too real and does happen from time to time. To avoid creating an awkward situation with your roommate, always discuss your plans in advance and never assume your roommate will be accepting of your wishes. 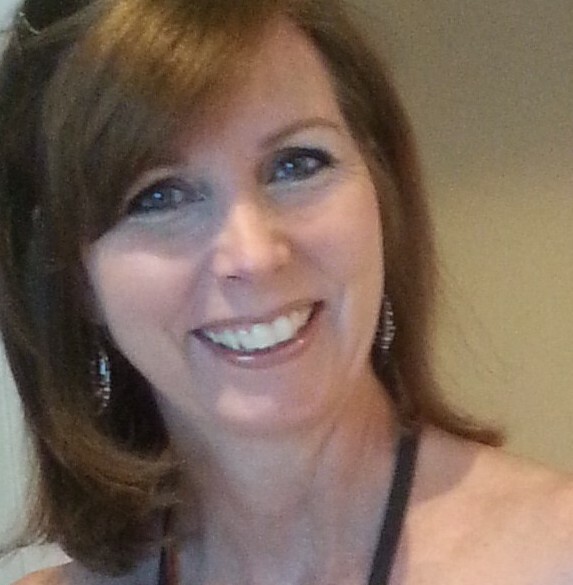 We all have them – little idiosyncrasies or quirks that are simply a part of who we are. Whether you do 500 sit-ups every night before you go to bed, line your clothes up in your closet by color and season or if you have a moderate germaphobia, the best thing to do is fess up in the beginning so your roommate isn’t blindsided by your slightly peculiar behavior. There are just some foods you need to steer clear of in dorms. Reheated Chinese, Kimchi, hard-boiled eggs, any type of fish and even hotdogs can leave a lingering odor that not only permeates the dorm but the entire dorm floor. If you have a craving for something that’s bound to smell up the room, do yourself, your roommate and everyone on your dorm floor a huge favor and head down to the dining hall or grab an Uber and head to the nearest restaurant. With a busy schedule packed with classes, labs, study sessions, activities and other commitments, it’s unreasonable to think you can keep your side of the dorm immaculate all the time. However, when your laundry is overflowing, your dirty dishes are piled up on top of the microwave and the leftover mac and cheese you ate three days ago is taking on a life of its own, it’s time to clean. Rare is the case when two roommates have the exact schedule, which means you both have to be respectful and understanding of each other’s need to come and go throughout the day. You’ll find it won’t be long before you know your roommate’s schedule as well as you know your own and you’ll develop a routine that works for both of you. In the meantime, do your best to remain flexible and go with the flow. Sometimes, no matter how hard you try to resolve an issue with a roommate, you hit an impasse that requires unbiased intervention. Nearly every college assigns RA’s (resident assistants) on every dorm floor to monitor dorm activity and strive to keep everyone safe. The RA is also typically trained to help smooth out roommate conflicts when they arise. Don’t be afraid or embarrassed to reach out to your RA if and when needed. That’s what they’re there for. 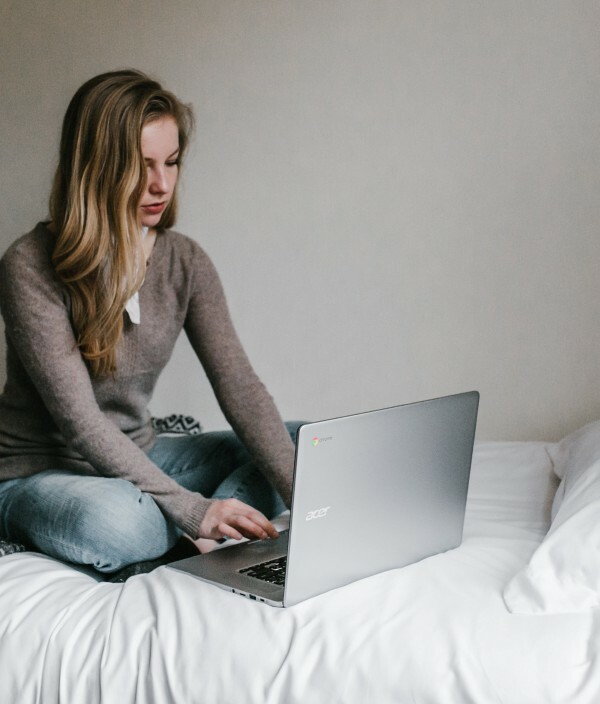 Even if you choose not to use the official roommate agreement offered by your college, there are important issues you and your roommate should discuss early in the semester. Pertinent issues you both agree on relating to sharing items, cleaning schedules, guests in the room, alcohol, etc. are all topics of conversation that are important to have early on to avoid possible issues. 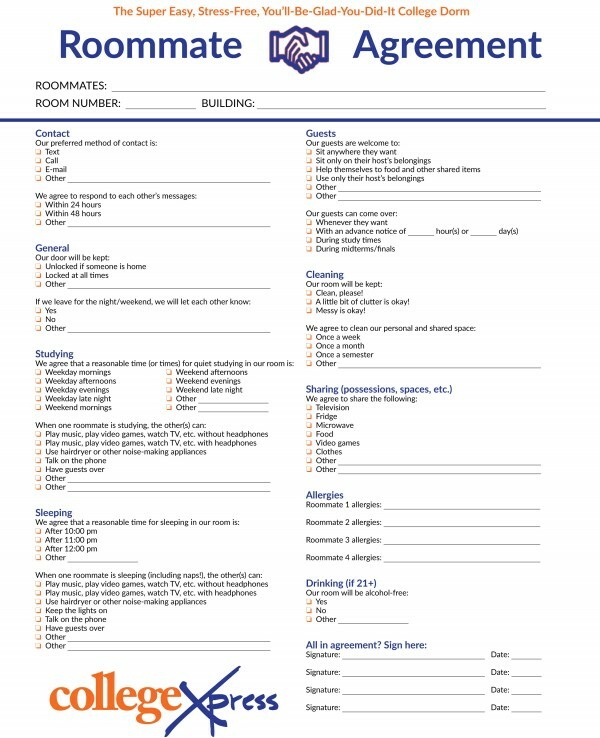 If you’re looking for a roommate agreement to get the conversation rolling, click HERE. Being a good roommate requires being a good communicator and a good listener. Talk with your roommate; get to know them, their likes, dislikes and what their expectations are. Above all, never assume your roommate will be on board with something prior to discussing it with them first. The more communicative and open you are with your roommate, the less chance there will be for miscommunication, mistrust, and issues down the line. Sounds somewhat contradictory considering you’ll be living in a space that’s barely big enough for one person. But, everyone needs a little breathing room. Don’t be the roommate who only leaves the dorm long enough to go to class and eat. Leave, go the gym, hang out with friends in their dorm, go to the library, take a walk – anything to give your roommate a little space from time to time. There’s absolutely nothing worse than being gone for a long weekend, coming back to your dorm and finding out someone you don’t know slept in your bed. Most college students really don’t appreciate it and consider it a total invasion of space and privacy (some actually get a little grossed out) thinking a total stranger slept in their bed. Never, ever assume this is okay without first chatting with your roommate. First of all, dorms are small. Secondly, most dorms have terrible ventilation. So, unless you’re prepared to sleep on the sofa in the common area until your room airs out, you might want to avoid throwing up in your dorm unless, of course, you really are ill (and didn’t party too hard) and can’t help it. Despite your best efforts to choose a great roommate, you may find after months of trying that there’s just no getting along. Remember, you’re on the road to adulthood which means it’s time to act like one. Avoid taking stabs at your roommate behind their back with friends down the hall. College is difficult enough. The last thing any student needs is the added stress of being ganged up on. Discuss the issue directly with your roommate or take it up with your RA, it’s that simple. There’s isn’t a college freshman out there who hasn’t had an occasional issue with their roommate. After all, no one is perfect. Do your best to let the small stuff go and avoid getting riled up about a single “offense.” If your typically respectful roommate walks in at 4 am when you’ve been asleep since midnight and decides he wants to make popcorn, consider giving him a one-time pass. Some mountains just aren’t worth dying on. Everyone has hopes not only of getting along with their roommate but developing a lifelong friendship with them. When you move in, take time to get to know your roommate and include them when possible – i.e. invite them to a football game, ask if they’d like to grab a bite to eat at the dining hall or see if they’d like to study together. While you may not become best friends, it will make it far easier for the both of you if you’re cordial and friendly with one another. Regardless of whether your roommate is your bestie or someone you simply tolerate, always be there for your roommate when they’re sick. It’s difficult enough when you’re feeling awful, let alone feeling awful when you’re miles away from home in a small dorm without anyone to care for you. If your roommate needs medicine, warm soup, a cup of tea or a cozy blanket, model the type of roommate you would appreciate if you were flat on your back with the flu. One of the most common misconceptions about college life is that your roommate has to be your best friend. That’s a lot of pressure to put on a new relationship. If your roommate becomes your friend, that’s great. However, if you and your roommate simply aren’t finding the connection you’d hoped for, don’t force it. Being friendly, respectful and civil will go a long way to make your living arrangement harmonious, manageable and stress-free. If this friendship is going to last, I’m definitely going to need my own box. Are there any additional rules you feel should be added to the list? Feel free to leave a comment!